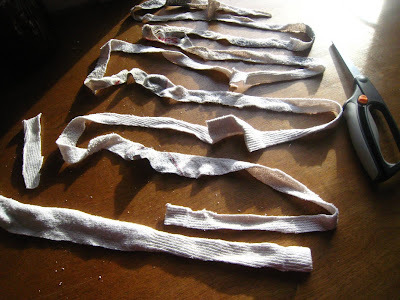 1. to begin, you will cut a sock into long continuous strips like you would for making a rag rug. 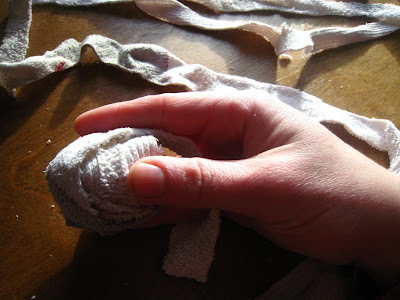 you can cut up and down the length of the sock back and forth, leaving the ends connected, or you can cut around the cuff of the sock in a spiral all the way down. 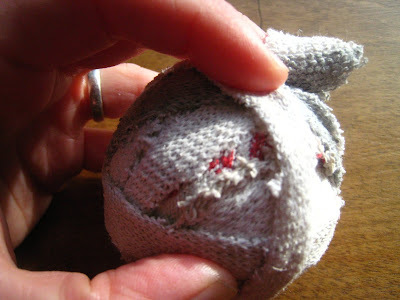 2. begin rolling your 'sock yarn' into a ball. stretch and smooth it as you go, wrapping fairly tightly. 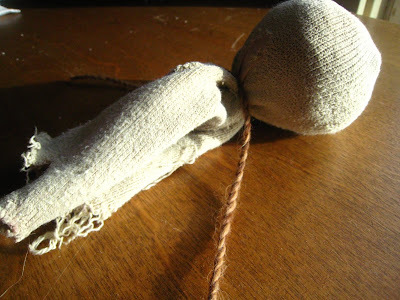 when i made my first doll, the head was made from wool roving, pulled into a fine strand and wrapped the same way. i think you could even use yarn for a base, if you wanted. give it a go! 3. keep wrapping, crossing directions all around, smoothing all the way, tightly. 4. you can stop at any time if you're making a small doll, or add more 'sock yarn' material for a large one. just tuck your end under a few other strands at your stopping point. 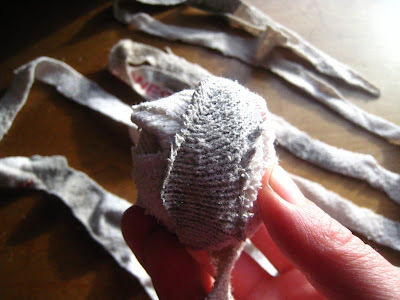 5. use another sock over your sock ball base. smooth it down as much as possible and tie around the neck with a piece of sturdy string. the material used for this on the traditional waldorf doll is stockinette (at bottom of linked page), which is sort of like, well, sock!